As the first poem was commissioned in October, they explored the themes that arise from Black History Month. Joelle Taylor, their professional mentor, works with each of the poets to hone their skills and support them to produce poetry that explores relevant themes and ideas whilst developing their own personal style. Read each of the poets’ work below, alongside an explanation of their ideas. 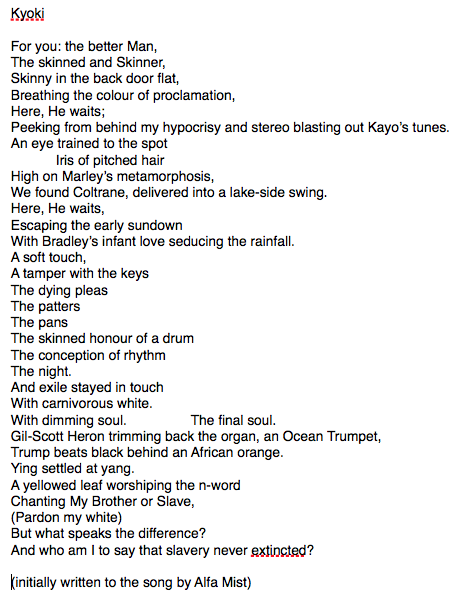 Kyoki is a poem which I have written in an attempt to represent the residing force of racism in the modern day. I also wanted to explore the incredible injustice, yet incredible love and pride of black people. I began by listening to and reading lots of music and poetry written by black artists such as Charles Bradley, Gil-Scott Heron, John Coltrane, Fela Kuti, Bob Marley, The Last Poets and Kayo Chingonyi. Many of these artists challenge the idea of race and racism through rhythm which, I think is reflected in the poem. For me, Kyoki conjures an image alternating between African and American black culture. The musical element is key in all of it as this is where I feel race is reflected most. It’s about the history of Bristol and in particular the recent debate surrounding whether Colston Hall should have a name change because of its attachment to Edward Colston. 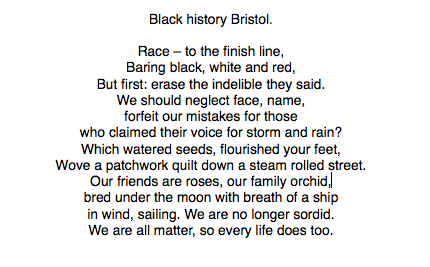 It's about how Bristol has been shaped by it's history and grown to become such a wonderfully diverse place - how we can't erase our connections to slavery because it's a reminder of the ugly past. It’s the idea that beauty will continue to grow from it no matter what. I asked people around me, friends and family, of a word that to them embodies black history. I kept it very vague so it was what it meant to them. I then used those words and incorporated them into my poetry, they are the words in bold and I used them as inspiration and a basis of which I could then have some room to write what it means to me. Most of the bold words are other people’s but Nelson Mandela is what I chose as to me he is incredibly inspiring and he used the injustice and helped make a change. It is about Bristol's silence and guilt around the slave trade and the ways in which we are trying to break the silence by teaching children to try and ensure that we do not make the same mistakes again. 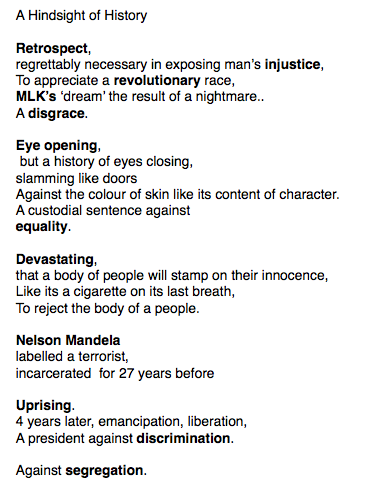 This poem reminds people how discrimination towards people of colour has not stopped and how history continues. It shows two black men who have been killed in the modern day and how justice hasn’t been served. 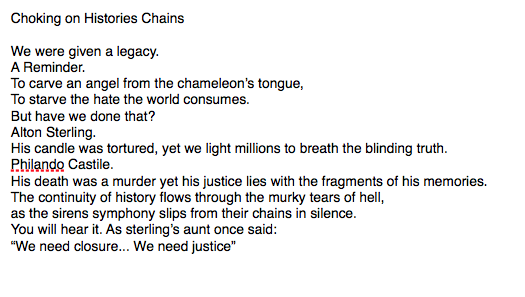 It’s a poem to remind others that we need to change our society before history is repeated.